Joe Bebco’s article (“What Is To Be Done?” March 2018) resonated strongly with me. As someone whose deepest sense of jazz’s immediacy and importance was formed by seeing my idols perform in smoke-filled clubs, I have tended to shy away from festivals and cruises. They seem almost as outdated as World’s Fairs. I remember how pale an imitation of 1939 was 1964’s edition of this event. Maybe the future was more trustworthy before, than after, WWII. A high school friend’s father’s color 8mm films of the 1939 Fair strongly suggested this. But there’s more to my lack of attendance than obsolescence. When it comes to jazz, there was something to club culture that I rarely found at concerts. I would watch as group leaders or featured players drifted over to the bar while other sidemen soloed, sometimes looking at them like proud parents, other times keeping a stiff upper lip of pretend indifference to keep criticism to themselves. Concert halls seem too linked to conservatories. I remember seeing groups crowded onto nightclub stages that barely could accommodate them, and yet triumphing over their confinement with blisteringly inspired music. But this only skims the surface of club culture. There was a feeling that one was at a place of origin for the music they were hearing. Suddenly Birdland or the BlueNote were part of a historic present—and the listener was involved in continuance, nourishing the music, inspiring its growth. 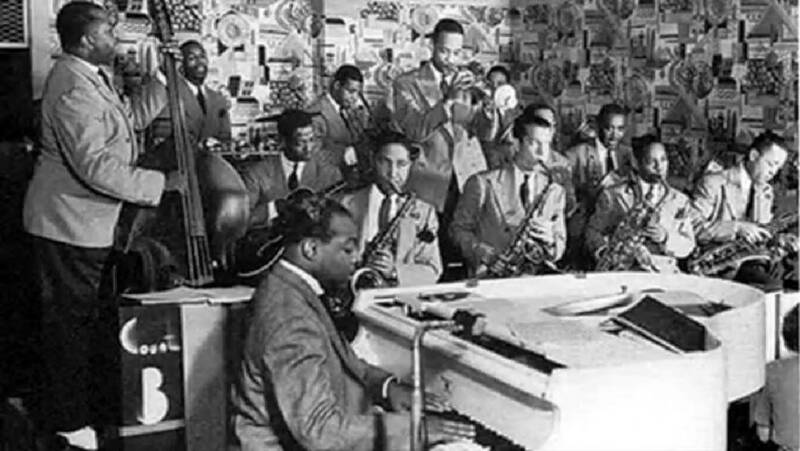 Except for Duke Ellington’s rebirth at Newport in 1956, I have found festivals and concerts to be more like museums where preservation and remembrance takes precedence over innovation and provocation. But Duke turned Newport into a ballroom. Of course, transformations are, or were, intrinsic to nightclubs. A vivid case in point: I remember seeing John Coltrane perform at Birdland around 1962, and the club owner shutting down all the lights to drive him off stage so the next act, Terry Gibbs, could come on. Even after his rhythm section had departed, he continued to play in almost total darkness for 10 minutes. Thanks only to the red light of an exit sign could Coltrane’s body be seen. They were ten of the most profound cultural and political minutes of my life because their defiant urgency taught me as much about art as they did jazz. A week or so later I saw Coltrane seat himself at the table next to mine in a Greenwich Village jazz loft and watch Cecil Taylor in rapturous amazement. Master came to visit master. It was that intimate. Coltrane was asking Taylor for directions to his future and the pianist was supplying them. Okay, I’ll admit it. I’m a Peter Pan when it comes to jazz. It won’t let my spirit grow old, although there is little it can do to prevent the aging of the rest of me. So maybe I seek excitement that I shouldn’t expect. But I watched a video of Matt Munisteri performing Willard Robison’s “Lonely Acres (In the West)” live almost exactly as the composer did on the 1926 record—and I wanted to be there in that club or space where he was making music and love all at once. “Lonely Acres” in his hands was a fresh and radical as it was back when the composer could count several recordings of his incredible song. It has to do with energy, I guess. Or maybe we need to theme festivals to focus on the essential figures and their innovations. I know I’d pay to attend, even serve as usher for, a Willard Robison festival. He died 50 years ago. Why not use this year as an excuse to honor him? Maybe he’ll merit a postage stamp. One last point: the past is alive and well, reincarnating as inspiration for the present. Most of my friends have been as late as me in making time treks beyond the Swing Era. So pre-1930 jazz was a black hole for them. It was for me, too, until modern players like Don Byron insisted on pointing their own music—and me—back to those Syncopated Times your magazine celebrates. Maybe we need to show that continuance is more than note-for-note replication of old recordings. Like Geoff Muldaur’s salute to Bix, Private Astronomy, the old music speaks in new tongues of youth and acts both as portal and catalyst. Hell, I just found some 1953 records of Red Nichols playing what must be regarded as a homage to the avant-garde jazz of the 1920s. His versions of “Peaceful Valley” and “Deep Summer Music” were ennobling. These recordings hit me as squarely and directly as first hearings of Duke’s and Bird’s “Ko-Ko’s.” The reverence crystallized the music, as well as its impact. You can go home again as long as the music serves as home. Jazz, by its very nature, provokes the discoveries it makes. You can’t close Storyville. Anyway, thanks for letting me sound off. You have been instrumental in guiding me to and through the heritage that keeps us as young as time will permit.